I'd like you to meet an old friend of mine that came to visit in the Dining Room this year. He usually lives in the Family Area downstairs, but he's making an appearance in a special place to help us celebrate the joy of the Christmas Season. 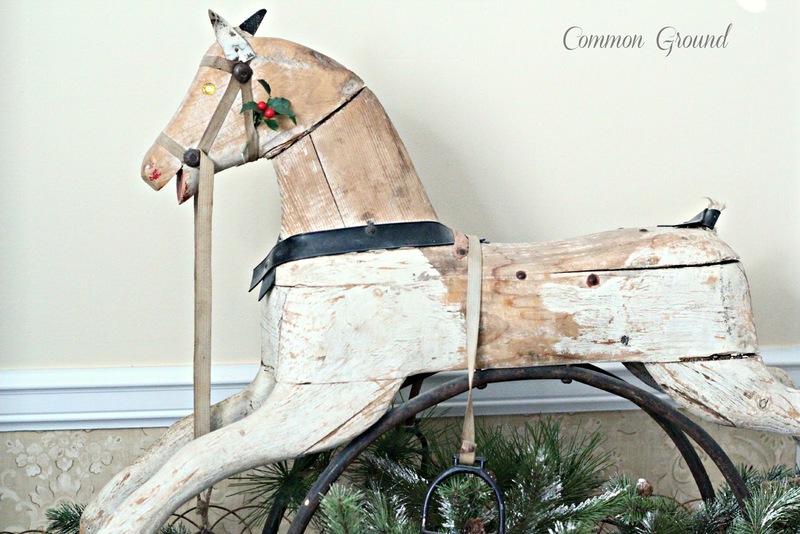 My parents were antique lovers from the beginning, so when they found this wonderful wooden horse, it was already "vintage". He was a gift to me when I was very little. I think I may have been placed upon him only once, and after that they realized he would be better suited to being admired than ridden. and added a little sprig of holly to dress him up. Don't you love his happy little smile? and his perfect white chippy "coat". on my old metal plant stand. This time of year as we celebrate Christmas, we realize that it holds a special place in our hearts for family, joy, and peace that only knowing Jesus can bring. Not only knowing the little baby that was born in a manger so many years ago, but knowing Him as our precious Savior, Comforter, and Friend. I want to express my deep sadness that I know you all are feeling too. Children are our greatest gift in this lifetime, and my thoughts and prayers are with all the families, grieving loved ones, and members of the community in Connecticut. Please keep them in your prayers. That horse is a gem, Debra. I love the horse, worn oh so just right. What a clever ideal to put it in the plant stand. Both items are among my favorite things. Merry Christmas, Richard from My Old Historic House! He is so adorable. I love his smile that is the first thing I tought of when I looked at him. What a treasure from your childhood to have now in your home to share with your Children and grand children. He is amazing. I think he needs to be the traveling horse and come to my home for awhile!!! :) Would love to have him as a guest of honor!!! Yes a horse with a perfect nayyy smile and so perfectly time worn, and a perfect piece to add to prayer, where the parents that cannot cuddle there babies this Christmas can be remembered in special child's prayer. I feel so heavy hearted for the sadness of this evil lost at the hands of one young man who so desperately needed God in his life. Debra this was a beautiful post. that's the nicest horse I've ever seen!! What a beautiful piece! I love your horse, and even more so because you've had him since you were a child. Hi Debra! Oh, your little vintage horse is just precious and the story of it being given to you as a little girl. He looks lovely where you've placed him. Love the old wedding certificate too. Wouldn't it be great to go to Ancestry.com and put in their names and see if you can up with anything! Thanks so much for popping in to see me and I'm honored you would pin my little Glitter houses. You know I'm gonna pin your little horsie too! 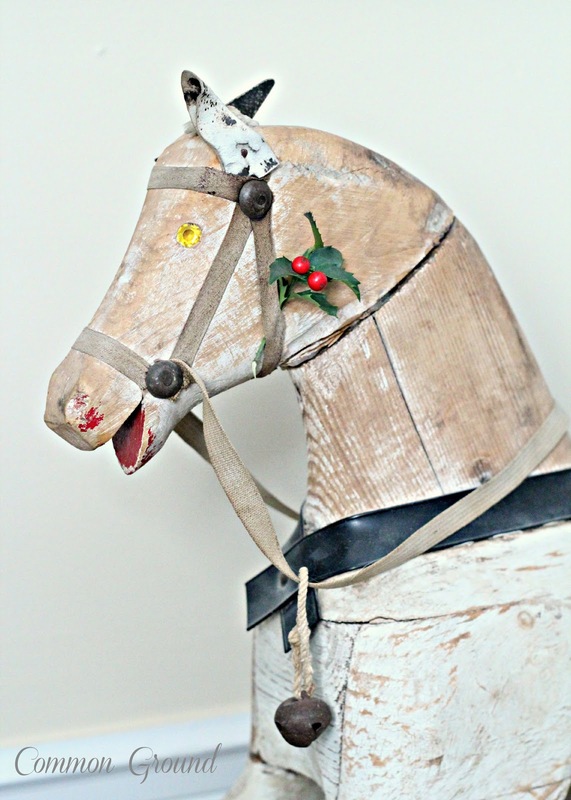 Wow...that vintage rocking horse is incredible. One of my favorite treasures you've ever shown! It's awesome that he comes from your family. And yes, we are all grieving for the families in Connecticut, God Bless each one. Beautiful sentiments and an adorable old horse. Love it. Oh...that horse rocks! 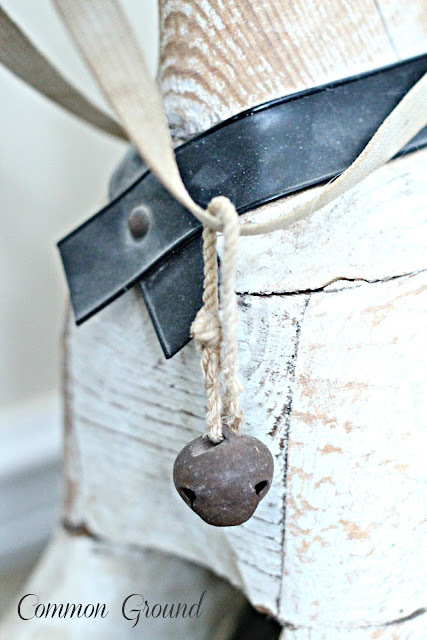 Such a lovely vintage piece, and the fact that you have it since your childhood! Precious! Your vintage horse is such a precious memory of your childhood! 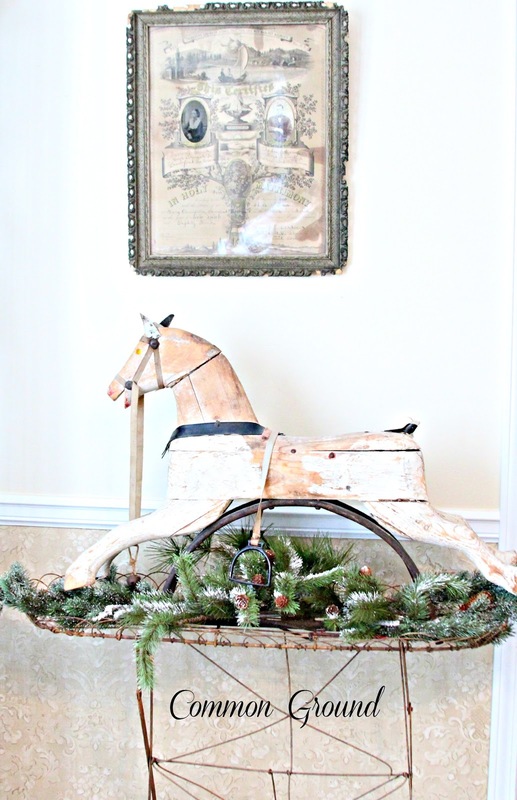 I adore that he has a place of honor in your dining room! Precious is the word for this post, too,my dear friend! May our Savior, Christ Jesus bring comfort to all during this recent tragedy in America's history! My prayers join yours to all affected. OH Debra...he is a true treasure... how beautiful! The horse is wonderful!!! I love it! Debra, What a treasure! I am in love with your horse. how lucky for you to have such a wonderful token of family memories. It's truly lovely. Your horse is definitely a treasure and even more so that he's been in the family and you have those memories to draw on! What an amazing treasure to find that marriage certificate. I am sure you WILL enjoy it for them. The history makes it so special. We fond old photos in a house once.. and never were able to get them to the owner or family. You know how much I love him too! So nice to think you have had him for so long. Perfect in your dining room. So saddened, like you about the CT tragedy. Saying lots of prayers too. Debra, your horse is amazing. And the way you have him displayed in the plant stand is just gorgeous. I also love your wedding certificate. 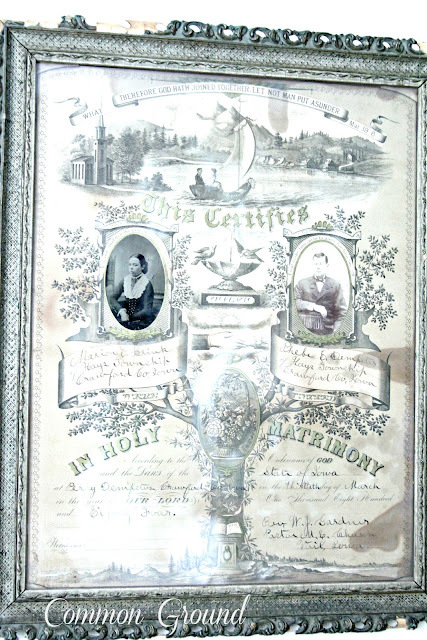 I actually purchased a baptismal certificate from the 20's in a beautiful frame to hang in my office (when I redecorate). The certificates of yesteryear are such beautiful pieces of art. The tragedy in Connecticut still has me reeling. I can't even begin to wrap my mind around how somebody could do something like this. My thoughts and prayers are also with those poor families whose loved ones and whose babies were taken from them so prematurely. Such a beautiful treasure, you are so blessed to have it, what memories you must have with him. So heartsick about the tragedy in Conn. so hard to wrap your mind around it. What a beautiful horse and even more special that it was from your childhood. So much sadness and horror this weekend--prayers and peace to all. What a great horse, Debra! 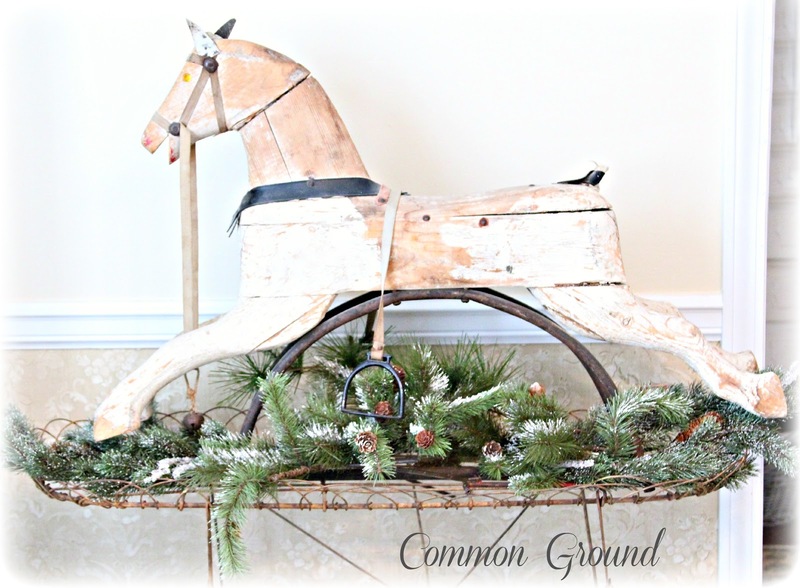 He looks beautiful among the greenery in your dining room. What a gorgeous toy. I'm taken to the scrap of red paint left on his snout! That wedding certificate is beautiful, too. I wish I had one like that from when I got married. I know you can order them online. I should've did it. What a tragedy for those sweet babies...that is why old holy cards show mental illness as a devil in shackles around someone's feet...it can cause such destruction and is so difficult to overcome for everyone involved, including the perpetrator. Sweet prayers for those perfect little children. Debra, that's one of the most unique and beautiful antique horses I've ever seen!! Just gorgeous! I had one that I used under my tree last year, but ended up selling him at the Luckett's show last year and now I'm missing him for Christmas! Our hearts are heavy here too.Keeping them all in our prayers. Debra, as someone who has searched for family for many years, I'd love to see the certificate find the descendents attached to those two love birds. Are you into genealogy? Could you find them on Ancestry.com? If not, I'd love to help you. I have found other family members for my friends and would love to do this if you'd like. And you absolutely have a GEM in that horse ! Wonderful ! Who says the old gray mare ain't what she used to be? That horse proves the older the better. 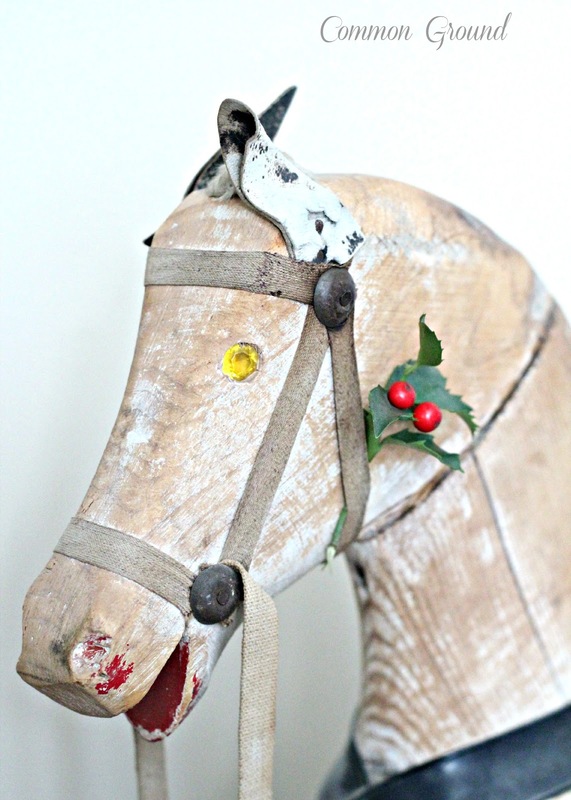 He's the perfect addition for Christmas - I say yay (not neigh)!! Sorry, bad horse humor! Pinning him - because he needs to get his blue ribbon! That rocking horse is just darling and such a fun thing to have to decorate for Christmas with! He is really amazing... I think he is one of my favorite vintage items I have ever seen. What a special piece. What a wonderful story. I think he's beautiful! Congrats on your feature in Romantic Homes Magazine. I saw you featured and was so happy for you.. Hope you have a wonderful week! Happy Holidays and Warm Seasons Greetings from Singapore~Sanghamitra. What a fabulous horse. Such patina! What a beautiful old horse. He is absolutely wonderful Debra! Love this horse!!! I've been looking for one, but can't find one that's less than $200!!! Maybe one day!! :) Until then, I'll admire yours! :) Hugs!! Oh, my, Debra. I love it. I would have to have him out all the time where I could enjoy it. How fortunate to have such a charming treasure from your childhood! The horse is so wonderful, perfect treasure indeed. I love this childhood treasure! What a perfect item to bring out during the holidays. I just love it!